Palmela is known for its wine, the golf courses, and the Arrabida Natural Park. Palmela is in the coastal region of Lisboa and has three major draws; its award winning wine, the fantastic golf courses nearby, and the Arrabida Natural Park for those who enjoy the great outdoors. The birthplace of Hermenegildo Capelo, a great Portuguese explorer, Palmela has attracted many famous people over the years including the Danish writer, Hans Christian Anderson. The town was originally named by the Romans, and during the Middle Ages it was occupied by the Moors until eventually the Portuguese conquered it in the 12th century. The Castelo de Palmela was built by the Moors and was positioned high on a cliff top with spectacular views of the region. It was later used as a Convent, and nowadays it serves as a luxury hotel, the Pousada Palmela. 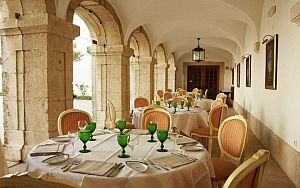 Retaining many of its original features, the Pousada has its own restaurant which serves wonderful seafood dishes and also has a small museum with exhibits of the site's archaeological finds. As mentioned, Palmela is known for producing some excellent wines. Their white wines were the first to get everyone’s attention and were made from the Muscat grape. They now focus predominately on red wines with their most important red grape variety being the Castelao Frances. This grape is also used to produce some excellent sparkling wines. Many of the vineyards are planted on the steep slopes and one of the best times to visit Palmela is in September when they celebrate the first grape harvest. Not far from Palmela is the Arrabida Natural Park is hugely popular with those who love the outdoors and hiking. It is a protected area that covers 108 square kilometres and filled with pine forests and Mediterranean type vegetation. There are two wonderful beaches in the park; Portinho da Arrabida and Figueirinha. They are both very popular with the residents of Libson, in particular the sheltered beach of Portinho da Arrabida with its crystal clear water. This beach attracts many scuba divers and underwater fishermen. Perched high on a hilltop overlooking the sea is a dazzling white 16th century Franciscan monastery, the Convento da Arrabida. On the slope of the hillside are five round chapels that were once used for meditation and peaceful solitude. For golf enthusiasts there is a wealth of choice with twelve highly rated golf courses in the Lisbon area. Many of the best ones are located between Estoril and Sintra which is northwest of Palmela. The Estoril Golf Club has 27 holes and was designed by McKenzie Ross. It also hosts International Golf Week in late October and early November. Perhaps the most famous and prestigious is the Pena Longa Golf Club which is north of Palmela and used to be a former monastic estate. The course was designed by Robert Trent Jones and has hosted the Portuguese Open. Quinta da Marinha was also designed by Trent Jones and is just outside Cascais. For a Championship standard golf course there is the Belas Clube De Campo which is 20 minutes from Lisbon and designed by William Roquermore. Other activities which can be enjoyed in this area include cruises on the River Sado, mountain biking tours, hot air ballooning, canoeing, and quad biking. There is even an opportunity to do some dolphin watching on one of the many boat tours that depart from nearby Setubal. So should you decide to visit Palmela there is something for all the family as well as excellent accommodation, superb cuisine, and a fantastic choice of local wines.